Having experience of playing football at all levels of the game, I know that it doesn’t matter whether you train everyday or don’t train at all, the feeling is still the same: Football can be mentally and physically taxing. A season normally lasts 9-10 months, and such is the popularity of the professional game at the moment, some players are expected to play all year round. 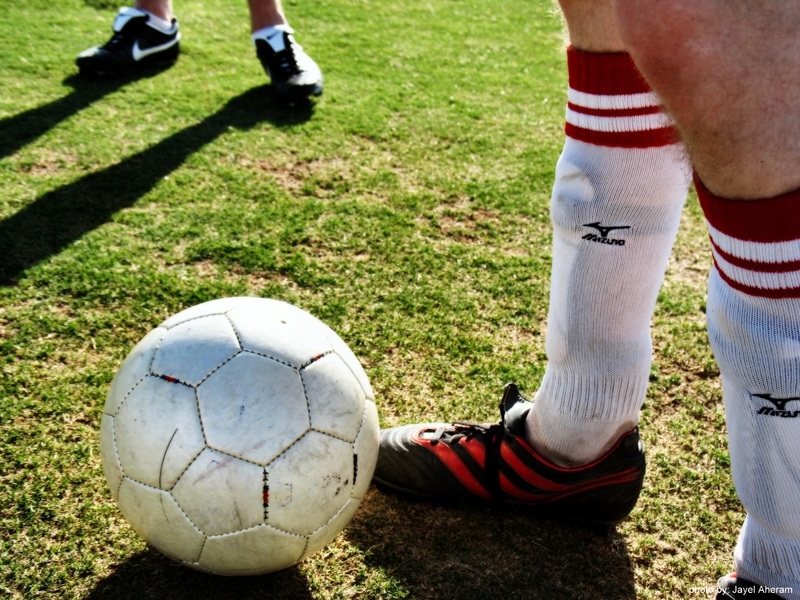 Regardless of the level you play at, your fitness levels will vary throughout the season. There are a number of factors that can affect your fitness. Just like professional players, amateurs get injuries and illnesses throughout the season. But unlike professional players, amateurs may not have the benefit of a full pre-season training period, daily professional medical attention from elite physiotherapists and sport scientists, nor will they have the time for appropriate training, rest and nutrition to aid development and recovery. In addition, amateurs also have the stresses of the “day-job” to contend with as well as the various distractions that occur throughout the year, like that sunny afternoon spent in the beer-garden or the extra slice of turkey and mince pies at Christmas! But do not fear, even amateurs can maintain their football fitness all year round! • Amateur players, subject to what level they play at and why they play, should take responsibility for doing extra conditioning work in their own time. • If your players are playing two games a week, e.g., Saturdays and Tuesdays, then conditioning takes a back seat and the four ‘Rs’ take priority: Rest, Recovery, Rehydration and Refuelling. Do not underestimate the benefit of sleep and of not disturbing the sleep patterns as part of recovery. • Nutrition is very important – get specialised help (Keep an eye on the Life Leisure Blog and speak to our Health & Fitness coaches!). Food and fluid intake does effect performance. • When working on a weekly cycle (Saturday to Saturday matches) follow the tapering principles, i.e. do conditioning drills in the early part of the week and technical, higher-quality work closer to matches. • Although every player is genetically different, our basic rule for improving cardiovascular fitness, subject to the time of the season, is to train three times a week, ideally achieving approximately 16 to 20 minutes in the upper training zone (85% to 95% of heart rate maximum). Note: there will always be exceptions to this rule. o Strength work with press ups, core work and lunges, etc. • Do the simple things well. Keep the sessions simple and specific, especially if time is an issue and overtraining is to be avoided. • Mix it up – keep conditioning fresh. There will by necessity be certain conditioning aspects you must continually repeat, but when the opportunity arises, employ variety. Examples include using different coaches to do sessions, sprint relays with a baton or a rugby or a tennis ball, or in different locations, and so on. • Do drills accurately and with specificity in mind. For example, in a match, players walk, jog, run and sprint, so your aerobic and anaerobic workouts without a ball should reflect this. As a specific example, sprints in a game last between two and five seconds, therefore drills should reflect this. • Educate the players. Get them to ‘buy into’ what they are doing by telling them that they will become better players. • Player mentality is important. Players will always ‘moan’ when they have to do a hard specific conditioning drill – it’s their nature! Their attitude on the day will always have an effect on the drill, so be positive and reinforce that it will make them better players. 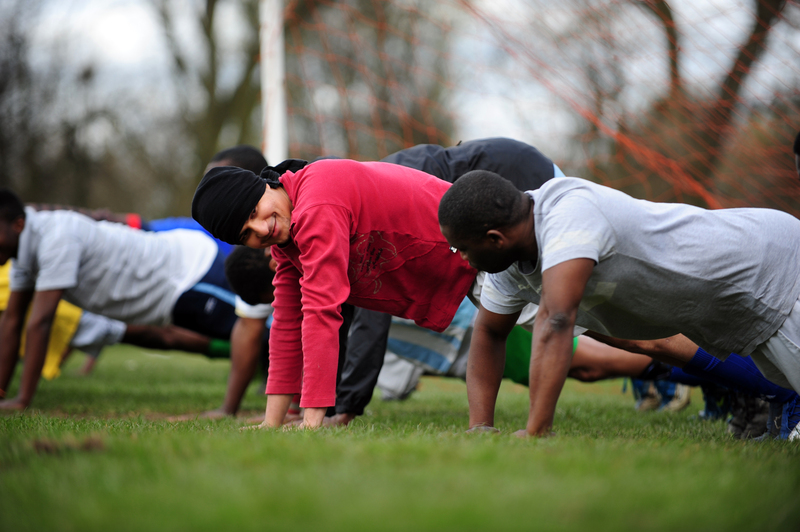 So, no matter what level you play football at, following these useful conditioning tips will ensure you maintain your football fitness all year round!